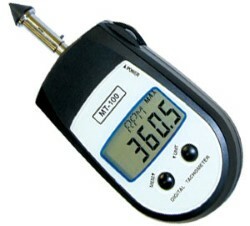 The MT-100 Contact Pocket Tachometer with microprocessor technology possesses the accuracy of the standard SHIMPO Tachometer line, yet within a compact, pocket-style body. The MT-100 provides users with the capabilities of measuring and recording speeds of rotational, linear and surface plus total length. These battery-operated tachometers feature the same rugged, high quality components that have made SHIMPO tachometers the benchmark in the industry. The user-friendly, value-packed units feature memory storage; quick selection unit’s button; length functions; retrieval of last, maximum and minimum values; plus each unit comes standard with a free N.I.S.T. calibration certificate. Each unit ships in a protective carrying case which includes a cone adapter, funnel adapter and 6” circumference wheel.